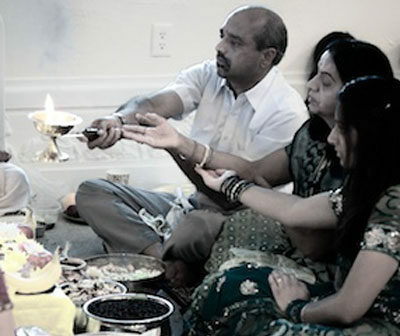 The Satyanarayana Puja is also available by request. The Sri Satyanarayana (Lord Vishnu) Puja is traditionally performed on the Purnima (full moon day) and Ekadashi (the night before the 11th day of the Vedic month) of every month. It is also performed on significant events, such as marriage, moving to a new house, business success, and in times of successful accomplishments. 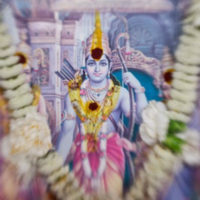 This Puja is a simple way to purify and surrender oneself to Lord Vishnu. A sincere worship of Lord Vishnu is said to grant all of your desires: spiritual and material fortune, family harmony, successful endeavors, and enlightenment. Sri Somesvara Temple will be performing the Satyanarayana Puja on full moon days. Please join us for this powerful ceremony on these auspicious days. If you are interested in performing this Puja, please schedule in advance. 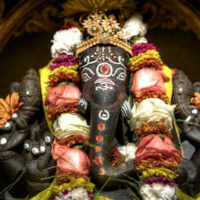 The Satanarayana puja starts with a Ganesh puja, and a prayer to the Navagrahas (the nine planets). The Trinity (Vishnu, Brahma, and Rudra) are also invoked during this Puja. The rest of the Puja consists of worship to Satyanarayana, who is considered to be the embodiment of the spiritual Truth that resides in everyone. At the end of the Puja, five stories about the benefits of the Satyanarayana Puja are read along with their deeper meaning. According to the scriptures, during Kaliyuga, the benefit that one receives by hearing the Satyanarayana stories are enormous. July Puja is replaced by Toli Ekadashi Satyanarayana Puja (annual Puja) on July 12 at 5:00 PM.